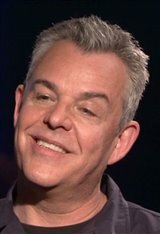 The son of Academy Award-winning director John Huston and the half-brother of Angelica Huston, Danny Huston was born to Zoe Sallis in Rome. He followed in his father's footsteps in 1984, when he directed the main title sequence for the feature film Under the Volcano. He continued directing both for TV and film until 1995, when at 32, he decided to give acting a try and played a small role in Leaving Las Vegas , starring Nicolas Cage. Since then he has appeared in a variety of roles in both independent films and Hollywood movies such as Timecode (2000); Ivansxtc (2000), for which he received an Independent Spirit Award nomination for Best Male Lead; 21 Grams (2003) starring Benicio Del Toro, Sean Penn and Naomi Watts; The Aviator (2004) starring Leonardo DiCaprio, and The Number 23 (2007) with Jim Carrey. In 2010, he played the role of Poseidon in Clash of the Titans and reprised his role in the sequel, Wrath of the Titans (2012). More recently, he starred in Tim Burton's Golden Globe-winning Big Eyes (2014), Ryan Murphy's series American Horror Story, the thriller All I See Is You (2016) with Blake Lively, Wonder Woman (2017) with Gal Gadot and in the comedy Game Night (2018). In 2019, he appeared as Hal Roach in the biopic Stan & Ollie (2019), about the legendary comedy duo Laurel and Hardy. Divorced from actress Virginia Madsen, Huston married Katie Jane Evans in 2001. Their daughter Stella was born in 2002, but by 2007, the marriage fell apart. Their divorce was never finalized, because Katie Jane committed suicide in 2008.